Agape Health Products General Health - Perfect 7 Intestinal Cleanser. 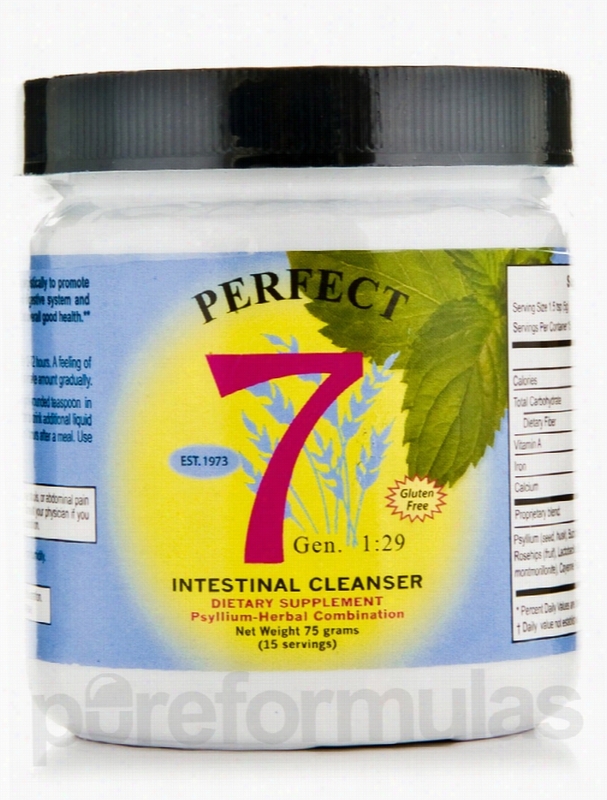 Perfect 7 Intestinal Cleanser Powder from Agape Health Products contains effective natural extracts that could support digestion&sbquo; cleanse the colon and digestive tract&sbquo; and relieve constipation. This supplement from Agape Health Products contains psyllium seeds and husk&sbquo; buckthorn bark&sbquo; alfalfa leaves&sbquo; cascara sagrada&sbquo; rosehips&sbquo; bentonite clay&sbquo; garlic&sbquo; cayenne&sbquo; and goldenseal. It is very important to maintain good digestive health&sbquo; because any disruption in the system could affect overall health. The herbs used here might have the ability to support and promote the health of the digestive system. Fiber is considered an important component of the daily diet and it plays an important role in digestion. Fiber can help you feel full&sbquo; stay full longer&sbquo; and support healthy bowel movement. The psyllium husk and seeds present here might provide optimum amounts of fiber to aid the system. Buckthorn bark is an herb that might positively support bowel ailments&sbquo; while the cascara sagrada may help relieve constipation by stimulating the mucosa lining in the colon. Also present here are cayenne and goldenseal that could improve the absorption and elimination of food. Alfalfa could induce appetite&sbquo; relieve indigestion&sbquo; and provide vitamins and minerals. Rosehips may be a good source of vitamin C and may support stomach health. The lactobacillus bifidus present in the special formula is a probiotic strain that could promote good digestive health. Goldenseal might support immune health and may be useful for reducing inflammation of the mucus membranes in the digestive system&sbquo; while garlic could aid in healthy digestion. The bentonite clay in Perfect 7 Intestinal Cleanser Powder from Agape Health Products might help cleanse the Body of toxins. These statements have not been evaluated by the Food and Drug Administration (FDA). These products are not meant to diagnoseÃ¢ÂÂ treat or cure any disease or medical condition. Please consult your doctor before starting any exercise or nutritional supplement program or before using these or any product during pregnancy or if you have a serious medical condition. Agape Health Products Metabolic Support - Perfect 7 Senna Herbal. 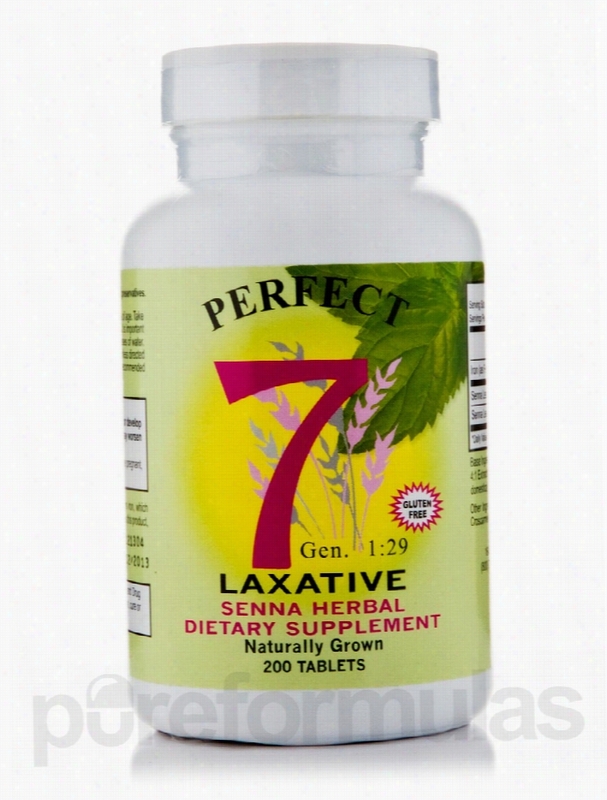 Perfect 7 Senna Herbal Supplement Tablets from Agape Health Products may provide gentle and effective digestive relief. Symptoms of constipation are hard stools and less than 3 bowel movements per week. Constipation can be painful and inconvenient. This specially formulated supplement from Agape Health Products contains senna&sbquo; tamarind&sbquo; figs&sbquo; prunes&sbquo; dates&sbquo; and apple fiber to potentially relieve constipation and support healthy bowel movement. Senna or Cassia angustifolia is a shrubby herb that is found commonly in parts of North Africa and India. It has been used as a laxative for ages and is known to stimulate the colon to potentially induce bowel movement. Tamarind is commonly used for flavoring in Asian cooking. The pulp obtained from the tamarind fruit is said to have various health benefits like antioxidant properties&sbquo; vitamin C&sbquo; phytochemicals&sbquo; and B vitamins. Apart from providing these benefits&sbquo; tamarind juice might act as a digestive aid. The prunes used in this supplement are considered a natural aid for constipation. Dates may provide relief from constipation&sbquo; diarrhea&sbquo; and intestinal issues. The figs and apple fiber added to the mix may provide optimum amounts of fiber required for proper digestion. This Perfect 7 Senna Herbal Supplement from Agape Health Products is an all natural&sbquo; vegan&sbquo; gluten free&sbquo; and non-GMO product that could help you find relief from constipation. These statements have not been evaluated by the Food and Drug Administration (FDA). These products are not meant to diagnoseÃ¢ÂÂ treat or cure any disease or medical condition. Please consult your doctor before starting any exercise or nutritional supplement program or before using these or any product during pregnancy or if you have a serious medical condition. 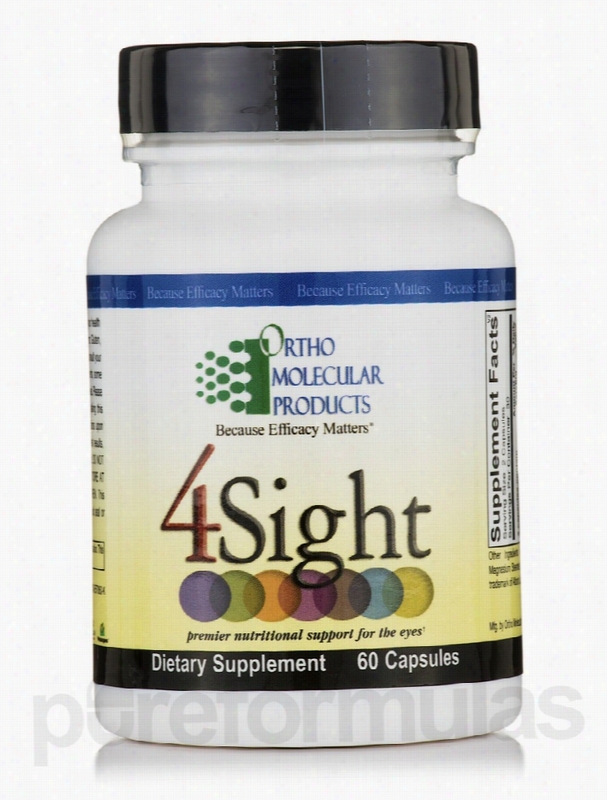 Ortho Molecular Products Cellular Support - 4Sight - 60 Capsules. 4Sight provides excellent support for those who want to maintain eye health&sbquo; and also for those with age-related Antioxidant issues. Developed in conjunction with a nationally known Ophthalmologist&sbquo; 4Sight was &ldquo;in the trenches&rdquo; giving support to those who needed it&sbquo; long before age-related antioxidant issues made the headlines with such great media exposure. Ingredients used in 4Sight are of the upmost quality&sbquo; ensuring you the proper support your eyes deserve. Many of the ingredients included in 4Sight&sbquo; such as lycopene and lutein&sbquo; have been used in studies for their role in supporting eye health.Why These Natural Ingredients?Lipoic AcidAlpha-lipoic acid is most widely known and used as an antioxidant. Lipoic acid is able to &ldquo;recharge&rdquo; other antioxidants such as vitamins E and C&sbquo; and glutathione and has been shown in studies to improve visual function.Ginkgo BilobaGinkgo biloba has historically been used to increase blood flow and and is used as an antioxidant. A few studies have shown that eye tissue has a high affinity for ginkgo&sbquo; making it a logical choice for eye support.Carotenoids (Lutein&sbquo; Lycopene&sbquo; Zeaxanthin)Lutein and zeaxanthin are found in high concentrations in the macula lutea portion of the eye. These two carotenoids are thought to quench free-radicals before they damage the lipid membranes. Low levels of lycopene&sbquo; one of 10 carotenoids found in the serum&sbquo; has also been shown to be a risk factor for poor eye health.BilberryBilberry extract contains high amounts of anthocyanadins&sbquo; components used in countries such as France and Germany for night vision support. These statements have not been evaluated by the Food and Drug Administration (FDA). These products are not meant to diagnoseÃ¢ÂÂ treat or cure any disease or medical condition. Please consult your doctor before starting any exercise or nutritional supplement program or before using these or any product during pregnancy or if you have a serious medical condition. Ortho Molecular Products Detoxification - Core Restore - 7 Day Detox. Core Restore detoxification program will transform your health by removing toxins&sbquo; enhancing digestion&sbquo; and improving nutrient absorption - Helping you feel more energized!Kit Contains:- Alpha Base capsules without Iron (30 Capsules)- PhytoCore (20 Capsules)- Core Support Powder (19 oz [546 Grams])- Core Restore Patient Guide.- A Convenient&sbquo; portable hand mixer.The Core Restore Kit is a strategic system designed to safely enhance and promote the primary pathways of detoxification in the liver. The Core Restore kit provides three active formulas &ndash; Core Support&sbquo; Alpha Base&sbquo; and PhytoCore &ndash; which function synergistically to support Phase I and Phase II pathways of liver detoxification to help neutralize environmental pollutants&sbquo; hormone disruptors&sbquo; unhealthy estrogen metabolites&sbquo; xenoestrogens (synthetic compounds that imitate estrogen)&sbquo; and other harmful toxins. This powerful trio of specialized formulas provides Essential micronutrients&sbquo; phytonutrients&sbquo; and a source of easily digested&sbquo; low-allergen protein that purifies the liver and fuel optimal biotransformation. 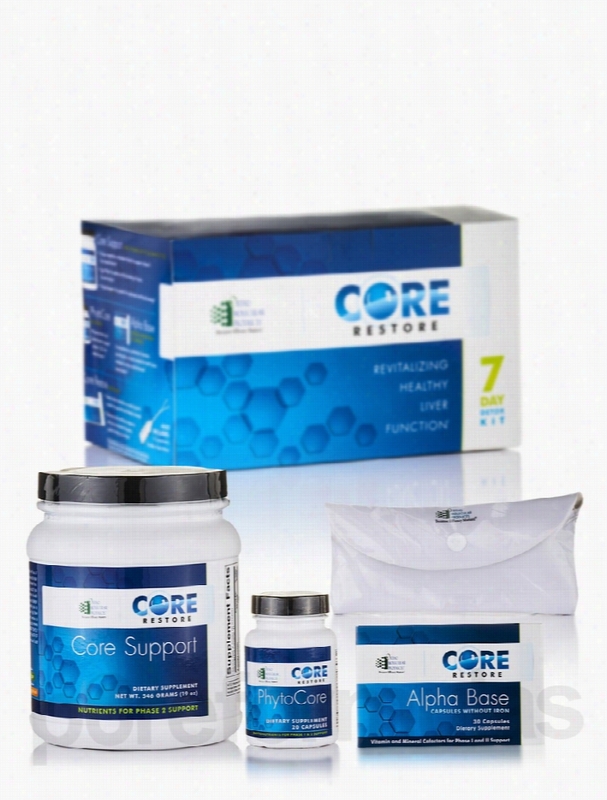 The Core Restore Kit is an easy-to-follow&sbquo; 7-day program&sbquo; complete with an in-depth Patient Handbook&sbquo; designed to reduce the incoming burden of toxins and help restore optimal health.Clinical Applications:- Revitalizes Liver Health and Supports Natural Detoxification Mechanisms.- Focuses on Both Phases of Liver Detoxification.- Provides Micronutrients&sbquo; Phytonutrients&sbquo; and Cofactors that Support Detoxification of Xenobiotics and Xenoestrogens.- Supports Healthy Estrogen Metabolism.- Increases Antioxidant Protection and Glutathione Production.- Promotes Gastrointestinal Health. These statements have not been evaluated by the Food and Drug Administration (FDA). These products are not meant to diagnoseÃ¢ÂÂ treat or cure any disease or medical condition. Please consult your doctor before starting any exercise or nutritional supplement program or before using these or any product during pregnancy or if you have a serious medical condition. 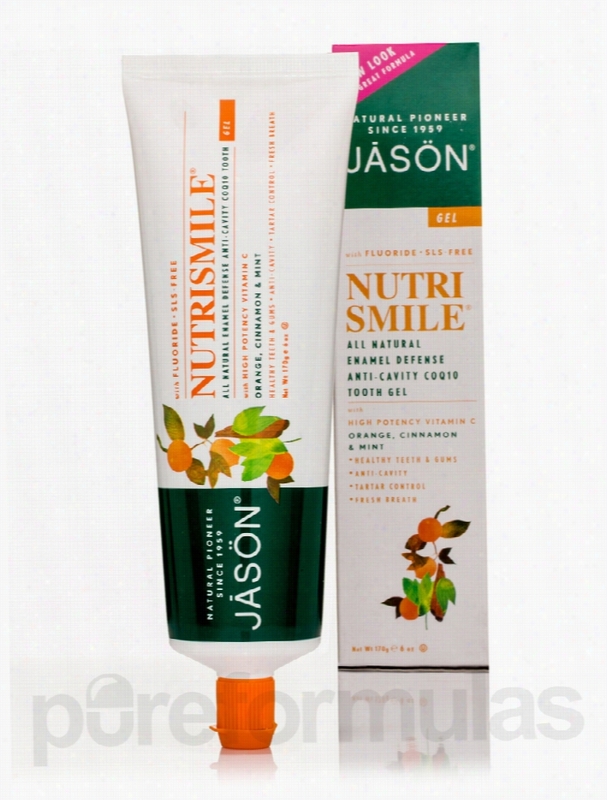 Jason Natural Products Oral Health - NutriSmile Enamel Defense. Jason&reg; Natural Products brings Nutrismile&reg; Enamel Defense Anti-Cavity CoQ10 Toothpaste with Fluoride (Orange&sbquo; Cinnamon &amp; Mint 6 oz (170 Grams) that helps provide nutrition to your teeth. Besides&sbquo; it could leave you with a pleasant breath. Vitamin C in this formula appears to be the body&rsquo;s main water soluble Antioxidant. Many people believe that it helps strengthen the gum epithelium and promote healthy gums and periodontal tissues. Coenzyme Q10 (CoQ10) present in this formula from Jason&reg; Natural Products could act as an antioxidant&sbquo; thereby neutralizing cell destroying molecules called free radicals. Studies show that CoQ10 may maintain healthy gums by aiding in gum repair. In addition it may boost the integrity of the tooth enamel&sbquo; thereby fortifying your teeth. Fluoride is a mineral that aids in remineralization of the teeth to protect it from decay-causing acids. It gets attached to the enamel and could ward off the formation of cavities. In addition&sbquo; this toothpaste has a natural refreshing taste of orange&sbquo; cinnamon and mint that could leave you with fresh breath. Restore your dental health with Nutrismile&reg; Enamel Defense Anti-Cavity CoQ10 Toothpaste with Fluoride (Orange&sbquo; Cinnamon &amp; Mint 6 oz (170 Grams) from Jason&reg; Natural Products. These statements have not been evaluated by the Food and Drug Administration (FDA). These products are not meant to diagnoseÃ¢ÂÂ treat or cure any disease or medical condition. Please consult your doctor before starting any exercise or nutritional supplement program or before using these or any product during pregnancy or if you have a serious medical condition. 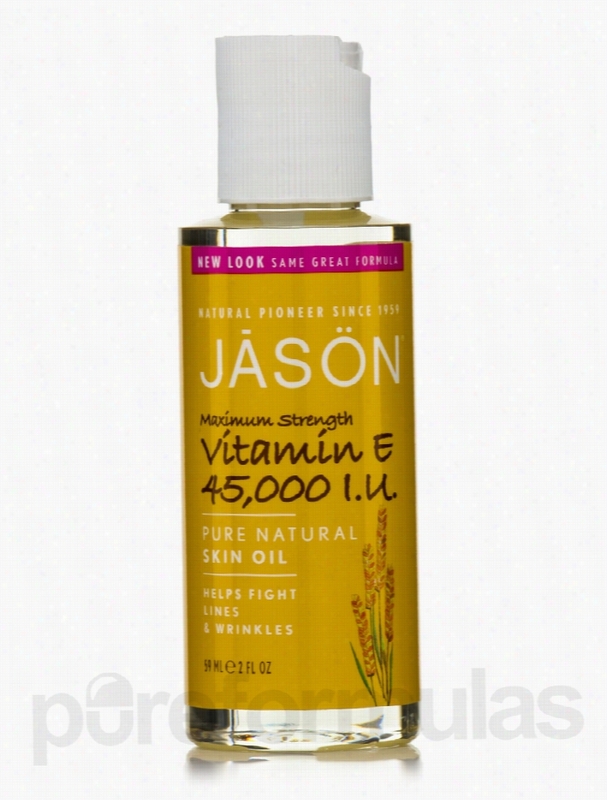 Jason Natural Products Skin Care - Vitamin E Oil 45,000 I.U. - 2 fl..
Banish fine lines and wrinkles with Vitamin E Oil 45&sbquo;000 I.U. 2 oz from Jason&reg; Natural Products. It helps nourish&sbquo; protect&sbquo; moisturize and rejuvenate your facial skin. This organic product contains vitamin E that could have antioxidant capabilities thereby destroying harmful free radicals. Free radicals may be responsible for the appearance of fine lines and wrinkles on the skin. Vitamin E may also cleanse the skin of dirt and debris&sbquo; giving it a fresh glow. Black currant oil present in this formula from Jason&reg; Natural Products is rich in essential fatty acids&sbquo; vitamins&sbquo; minerals and antioxidants that could promote skin Health. It may hydrate skin and prevent premature signs of aging. Evening Primrose seed oil is rich in essential fatty acids and gamma linolenic acid that could moisturize the skin. Macadamia seed oil is rich in fatty acids and phytosterols that help hydrate and heal skin. Borage seed oil contains salicylic acid&sbquo; omega-3 and omega-6 fatty acids. It could tone the skin&sbquo; rehydrate and nourish it. Switch to Vitamin E Oil 45&sbquo;000 I.U. 2 oz from Jason&reg; Natural Products and restore your skin health. These statements have not been evaluated by the Food and Drug Administration (FDA). These products are not meant to diagnoseÃ¢ÂÂ treat or cure any disease or medical condition. Please consult your doctor before starting any exercise or nutritional supplement program or before using these or any product during pregnancy or if you have a serious medical condition. Jason Natural Products Hair - Thin to Thick Extra Volume Conditioner -. Thin to Thick Extra Volume Conditioner 8 oz (227 Grams) from Jason&reg; Natural Products may be just the conditioner for you to nourish&sbquo; cleanse and add volume to thin hair. This organic product also aids in managing hair ends&sbquo; giving your hair a thick and glossy appearance. Biotin and panthenol are B vitamins essential for maintaining hair health. Studies reveal that both these vitamins could coat and even permeate the hair shaft&sbquo; thus strengthening it&sbquo; apart from adding Body to it. Another benefit of panthenol is that it could moisturize your hair and improve flexibility. Vitamin A present in this conditioner from Jason&reg; Natural Products is rich in antioxidants that could nourish and moisturize the scalp and make it more manageable. This conditioner also contains vitamin C that helps improve blood circulation to the scalp&sbquo; thereby leaving your hair healthier and stronger. Vitamin E&sbquo; a fat soluble vitamin may have antioxidant properties and improve the immune system. It may stimulate the scalp for better hair growth&sbquo; repair split ends and condition it. 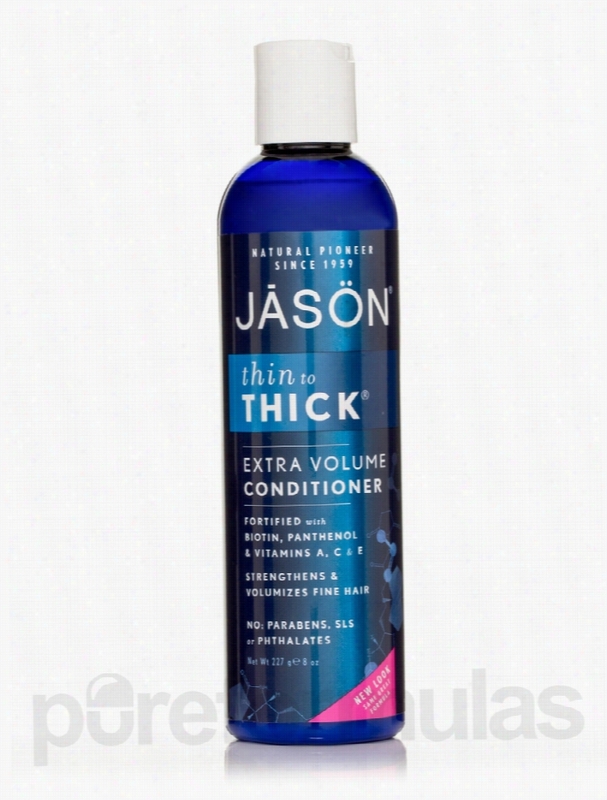 Switch to Thin to Thick Extra Volume Conditioner 8 oz (227 Grams) from Jason&reg; Natural Products for enriching your hair. These statements have not been evaluated by the Food and Drug Administration (FDA). These products are not meant to diagnoseÃ¢ÂÂ treat or cure any disease or medical condition. Please consult your doctor before starting any exercise or nutritional supplement program or before using these or any product during pregnancy or if you have a serious medical condition. 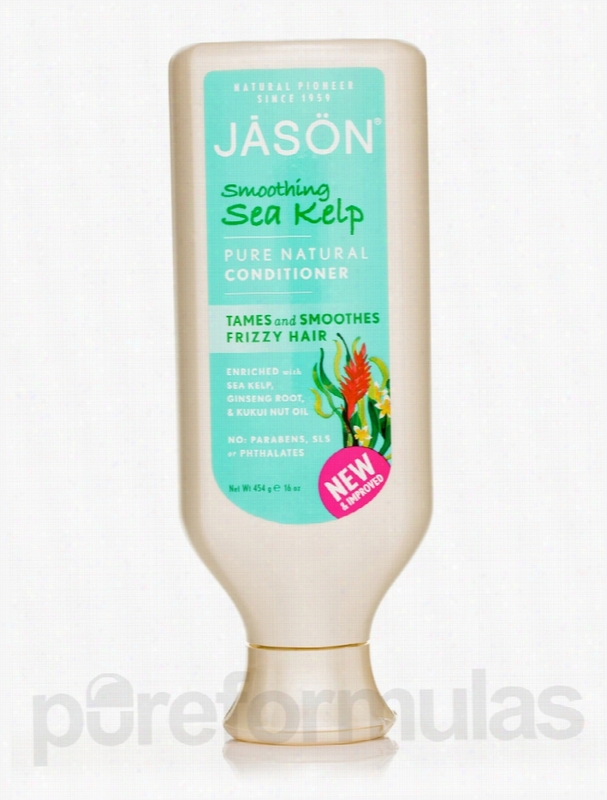 Jason Natural Products Hair - Smoothing Sea Kelp Conditioner - 16 oz. If you are looking to control and tame frizzy hair&sbquo; you may want to use Smoothing Sea Kelp Conditioner from Jason&trade; Natural Products. While sunflower seed oil in the conditioner might tame the frizz&sbquo; and kukui nut seed oil potentially hydrates and softens your hair. Algae extract in this herbal conditioner from Jason&trade; Natural Products could restore shine and bounce while adding to your hair&rsquo;s volume. Natural sea kelp is enriched with vitamins&sbquo; Minerals and fatty acids and may rehydrate dry hair. It may take care that your hair does not weigh down after conditioning. Ginseng root and Plumeria acutifolia may control and calm frizzy conditions. Calendula officinalis and chamomile flower extracts could bring about a suave texture to your hair. Grapefruit and Equisetum arvense leaf extract might give a sleek&sbquo; nourished look to your hair and control split ends. Lavender flower extract appears to calm frizzy strands of hair. Ginger root extract in Smoothing Sea Kelp Conditioner from Jason&trade; Natural Products may give a nourished look to your hair. These statements have not been evaluated by the Food and Drug Administration (FDA). These products are not meant to diagnoseÃ¢ÂÂ treat or cure any disease or medical condition. Please consult your doctor before starting any exercise or nutritional supplement program or before using these or any product during pregnancy or if you have a serious medical condition. 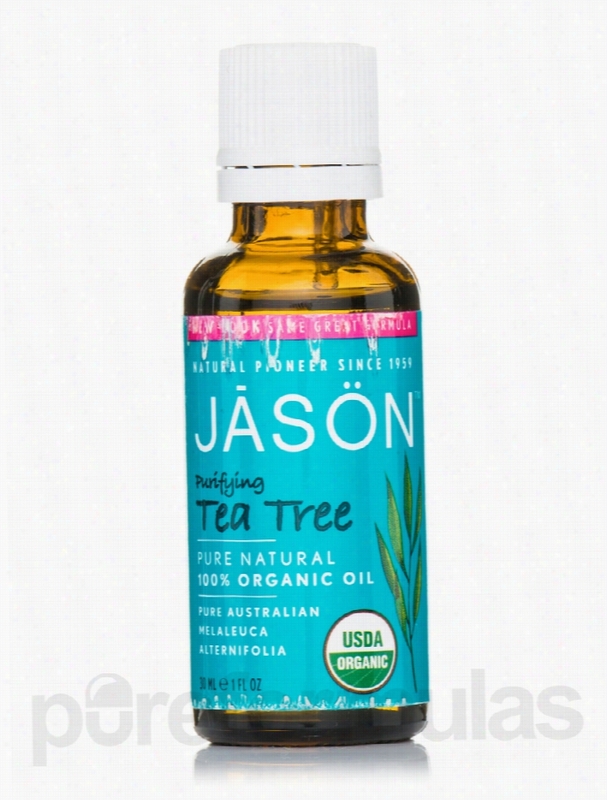 Jason Natural Products Botanical Oils - Purifying Tea Tree 100%. Purifying Tea Tree 100% Organic Oil 1 fl. oz (30 ml) from Jason&reg; Natural Products is an organic product that may be helpful in promoting healthy skin. This formula contains Melaleuca alternifolia leaf or tea tree oil that has the ability to combat harmful microorganisms that appear to pose a threat to your skin&rsquo;s health. For years tea tree leaves have been used as a skin remedy by Australian Aborigines. Tea tree oil has a nutmeg-like fragrance. Its active ingredient is terpinen-4-ol that may have antibacterial&sbquo; antiviral&sbquo; antifungal and antiseptic properties. Studies show that tea tree oil present in this formula from Jason&reg; Natural Products may be helpful in promoting skin immunity as it easily mixes with the skin cells. Many people believe that tea tree oil could promote hydration of your skin&sbquo; soothe it and encourage healing. Switch to Purifying Tea Tree 100% Organic Oil 1 fl. oz (30 ml) from Jason&reg; Natural Products for enhanced skin health. These statements have not been evaluated by the Food and Drug Administration (FDA). These products are not meant to diagnoseÃ¢ÂÂ treat or cure any disease or medical condition. Please consult your doctor before starting any exercise or nutritional supplement program or before using these or any product during pregnancy or if you have a serious medical condition. Ortho Molecular Products Hormone/Glandular Support - SereTone - 90. Moodiness affects a lot of people&sbquo; especially if they don't get enough sleep. Being moody or stressed out for a long period of time can lead to serious negative consequences in your relationships and job performance. A bad mood may even lead to physical health conditions if the problem isn&rsquo;t addressed. If you're under a great deal of stress and having trouble controlling it&sbquo; you may benefit from a supplement like Ortho Molecular Products&rsquo; SereTone. Each capsule contains a blend of vitamins&sbquo; minerals&sbquo; and 5-HTP&sbquo; which may improve mood by helping your body maintain normal nerve function and produce more serotonin. Serotonin is a brain hormone that helps regulate moods&sbquo; alleviate headaches&sbquo; and promote more high-quality sleep. Taking care of yourself is essential to taking care of business. Some of the ingredients SereTone provides include: Vitamin B6&mdash;a nutrient that produces antibodies&sbquo; supports the nervous system&sbquo; and breaks down proteins. Calcium&mdash;a mineral that helps form and maintain strong bones&sbquo; while also helping the body secrete hormones and enzymes that send messages throughout the nervous system. Zinc&mdash;a mineral that plays a role in mood regulation. 5-HTP&mdash;a naturally-occurring amino acid that may help you sleep better&sbquo; feel less anxious&sbquo; and experience fewer tension headaches. 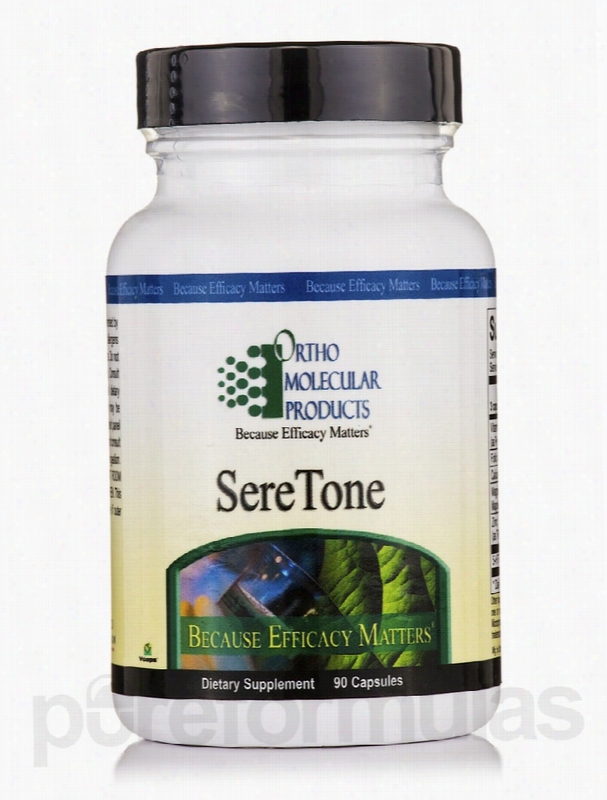 This bottle of SereTone by Ortho Molecular Products contains 90 capsules&sbquo; which should last for about one month at the recommended dosage of three capsules per day. These statements have not been evaluated by the Food and Drug Administration (FDA). These products are not meant to diagnoseÃ¢ÂÂ treat or cure any disease or medical condition. Please consult your doctor before starting any exercise or Nutritional supplement program or before using these or any product during pregnancy or if you have a serious medical condition.